Olivery is an incredibly enjoyable Italian establishment, with fresh food, friendly staff, and a lively atmosphere that is inviting without giving that feeling of being too busy. There are several pizza places in Tel Aviv, but very few embody the genuine spirit of Italy and Italian food like Olivery, without being pretentious and without feeling like you stepped onto a mafia movie set. The restaurant is quite small inside, but takes up a huge area with a patio space on Ibn Gvirol. 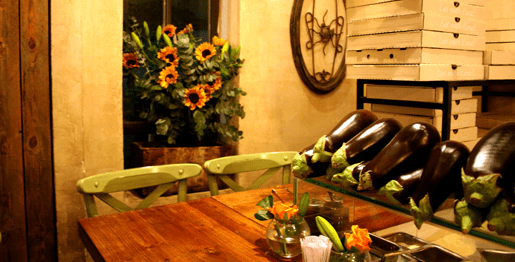 Inside Olivery with their soft yellow tones and green chairs is a quaint, rustic, intimate establishment. There are plenty of options for pizzas, but you can go half-and-half on some of them to maximize your palate and curiosity. The three mushroom and truffle oil pizza is a mushroom lovers delight, and the eggplant pizza is as well an earthy, warm, cheesy choice. The gnocchi with beet sauce and pistachio pesto was eye catching. The potato pasta was soft and delicious from start to finish. We ended our evening with the famed banana pizza, my friend Tomer kept raving about, but we quickly realized that it was a carb-heavy evening from start to finish. Olivery in Tel Aviv has many options on where to sit, and during the summer the patio is a perfect option. I would, however, recommend sitting by the pizza-prep bar and stone oven. My friend and I were placed their by his girlfriend that works there, and insisted it’s the best seats in the house. And she is right. It’s a great place for conversation with all the action going on right before your eyes. Olivery is a fantastic place for an evening out with family and friends. One thing I particularly enjoy about visiting a restaurant where friends work, or they know someone who works there, is the fact that you get the inside scoop on dishes and specials, an honest look at the place you are dining at and get that little extra attention. And on occasion some free-food-related freebies. Ziv set us up at the bar telling me it’s the best seats in the house. She offers some great advice on exactly which pizza to pick, and if deciding is too difficult, tells us the option to get half and half (of certain types of pizza). Tomer and I choose half three mushroom and truffle oil pizza and the second half of eggplant pizza. That way everyone seems happy and you get to try more flavors. 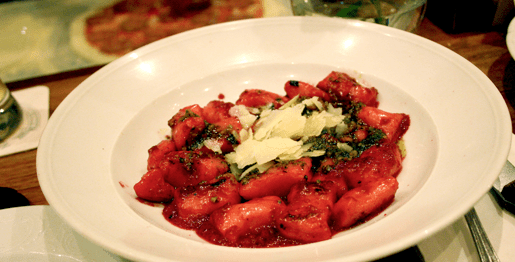 We also got the gnocci in pistachio pesto in a beet sauce, since I always get really happy when I see gnocchi on a menu. Gnocchi. Just try saying it without smiling. 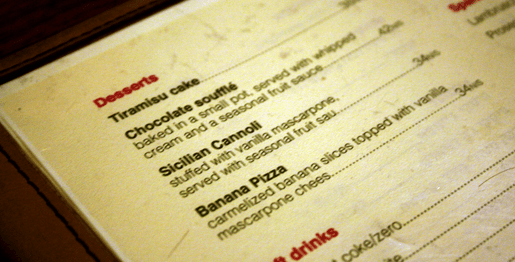 Tomer kept insisting that the Banana Pizza dessert is the “best-dessert-he-has-ever-had-ever-in-his-entire-life” and that we will get the dessert after our meal. Ziv is right — Tomer and I have the best seats in the house, right by the pizza prep area and stone oven. All the action takes place right before our eyes, much to our delight, as it helps us decide what we will order. And we get to see the prep-chef set things ablaze with her blowtorch. Ziv hooks us up with some a free breadstick appetizer to tie us over. And like many other Israeli establishments we got a couple of free chasers, limoncello naturally as this is an Italian eatery. By sitting at the bar we watched the pizza-chef delicately put together all the pizza pies, slide them on the banjo peel and place them in the authentic stone pizza oven. Our first dish was the gnocchi with beet sauce. It was a special that day that was an offshoot of their regular menu item – the gnocchi and cauliflower. I love gnocchi, and this was made fresh and tender. I particularly enjoyed the beet sauce because too often pasta dishes are a blank canvas and a bold splash of color is always appreciated. Tomer, reminisces about the gnocchi and cauliflower thinking our dish isn’t as large (I don’t think he’s right, it filled us up quiet easily). Second thoughts? I don’t think so. But Tomer did make a good point. That didn’t stop me from ordering the Banana Pizza. We had seen so many being prepared that night we just had to indulge. (And what kind of friend would I be to deny Tomer his favorite dessert?) Watching the dish being made at the bar is another reason sitting there was so enjoyable. Once the bananas are generously placed on the pizza dough and then covered in brown sugar, it spends a couple of minutes in the stone-oven. After that, the blowtorch is taken out, lit and the sugar is then caramelized. To top it off, the prep-chef pipes cool vanilla marscyepone cheese. 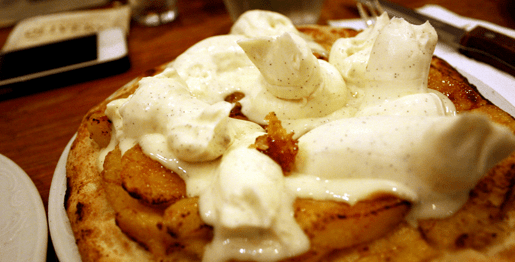 Let me repeat that for effect: To top it off, the prep-chef pipes cool vanilla marscyepone cheese. The service here is delightful and easy-going. I know Ziv and she is just a great person and an attentive server, but I got the impression that all the staff seem to be willing to help each other, are all smiling and very friendly (N.B. readers: tip generously.) It does get busy, so make reservations. That being said Olivery has plenty of seats on the patio to enjoy the night, but I recommend sitting by the bar. It’s busy and tantalizing to the senses with all the pizzas (banana included) made right before your eyes. If you are on a date it’s a good distraction if conversation seems to simmer. The mushroom pizza is worth its weight in truffle oil. It has a wonderful earthiness to it that should be enjoyed as often as possible. Their pizzas are simple but delicious. Olivery keeps this exciting without being overwhelming. Nomnom: If you do decide to get the banana dessert, forgo any breadsticks. While they are very tasty, it makes for a carb heavy dinner. Having pizza dough as the base for the dessert means you fill up even more. 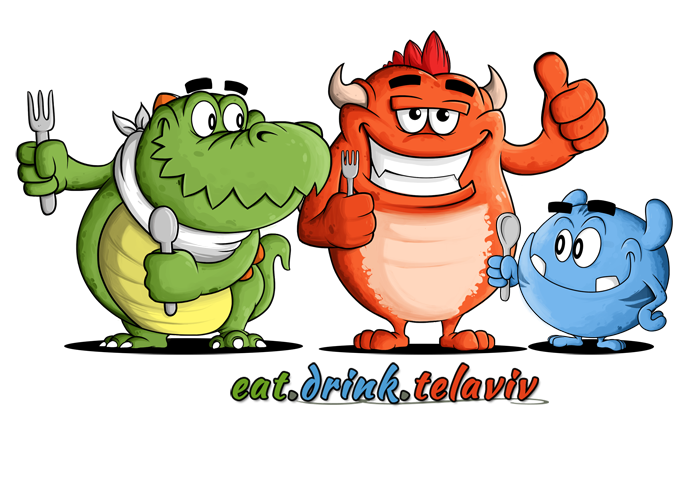 Our good man Tomer almost didn’t get the dish.